Dredging benzyne from an irregular shaped basin with Rotomite 180P. SRS Crisafulli. PROJECT DESCRIPTION: To dredge benzyne from the bottom of a 12 foot basin approximately 1,000 feet long and 500 feet wide and discharge it into the water column so biologic treatment (BUGS) could work. Once the basin contained an acceptable level of benzyne, the basin could be closed down without having to dredge the exposed material and dispose of it. KEY ELEMENTS OF JOB: The customer had an existing conventional cable hydraulic dredge in place for about two years. The problem was that the discharged dredged material would only stay suspended in the water column for about 10-15 minutes and then settle back down to the bottom of the basin. Therefore the exposure time for the "bugs" to react with the benzyne was poor. Another problem was the layout of the basin. The basin was irregular in shape making complete dredging impossible with a conventional dredge. Additionally there were a number of floating aerators in the pond suspended and secured by cables making maneuverability hard and costly to reposition the conventional cable dredge. 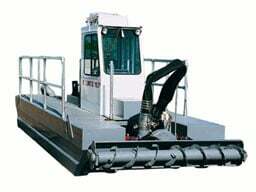 SOLUTION: The customer procured a Crisafulli-Rotomite 180-P self-propelled dredge on a lease/purchase option basis. The Rotomite 180-P was equipped with a 180 horsepower turbo-charged diesel engine, hydrostatic hydraulic power/control unit and a special cutter head with an "agitator" head. The agitator head would shear the dredged benzyne material to a much finer degree and therefore increase the surface exposure to the "bugs" and provide a much longer exposure time for the "bugs" to work. RESULTS: The self-propelled feature enabled the operator to dredge in areas where the conventional dredge could not. Also the operator could traverse the basin in any direction at any time without waiting to reposition the cabling system as with the conventional dredge. The labor cost alone saved the customer about $250.00 per day not to mention the increased production time of the Rotomite 180-P. Additionally, the special "agitator" head was estimated to increase the solids suspension/exposure time by 200%.